Here’s something that happened a couple semesters ago. At the beginning of class one day, I noticed a pile of handouts on the teacher’s desk left by one of my colleagues. I glanced at the handouts as my students were filing into the room. I realized I knew them. Not my students–the handouts. They were exercises, quizzes, PowerPoints, and tests I had created to supplement the open French textbook I use (COERLL’s Français interactif). You see, I still can’t help but feel these are somehow my children. I used to have such a helicopter-mom approach to these babies. I would nurse my creations into something to be proud of, protect them, hold them close to me, and never let them out of my sight. Today, all of our sections of French use this text. I have come to the decision to share just about everything I make for my own class with my colleagues. Here’s how it happened for me. I started by sending an email to my colleagues explaining the materials I had created, indicating whether students could keep a copy of the materials (no, in the case of tests), and pointing out any peculiarities to edit and customize for their own purposes. For instance, taking my name off the materials or substituting their own classroom stories in place of mine. I was worried my colleagues would think I was being too strict with my “rules.” Then I envisioned my poor colleagues trying to use my materials just as they are, without editing them to suit their particular classes. Inevitably, they would run into some issue with the materials in the middle of class that would leave everyone dumbfounded. Some inside joke only my students and I would understand. Unconventional grammatical structures, terms, or expressions I had added in response to my students’ questions. These were pitfalls that I was pointing out, and that was fine. I suppose it’s in our nature to worry about our creations. I do care about these materials I have created and decided to share. Yes, my heartstrings are tugged when I see an old quiz of mine abandoned on the teacher’s desk. But I have to accept that these materials will take on a life of their own once out of my hands and that I’m contributing to something larger than just my own classroom. Fortunately, I happen to teach at a place where other people share their materials with me. I can decide if I like them, if they apply to my class and learners, and how I might adapt them. Through all of this, I get the chance to evaluate and revise my own teaching. I guess that makes up for the fact that my own materials are no longer on lock-down here in the digital nest of my hard drive. We open educators can take comfort in knowing that our “children” will continue to function in some context once out of our hands. That they will get changed, misunderstood, edited, abandoned, praised, or rejected is just part of the process. It’s how they grow up. Do you have these concerns about sharing your personally created materials? How much do you share with colleagues or teaching assistants? What instructions, if any, do you give when you share? Are there rules about what they can do with what you share? When your colleagues share with you, how do you decide what to do with those materials? I’d like to hear how you share. Georges Detiveaux is Manager of Instructional Technology & Adjunct Support in the Teaching & Learning Center and French instructor in the Department of World Languages at Lone Star College-CyFair in Cypress, TX. He is also president of the South Central Association for Language Learning Technology (SOCALLT). To read more about sharing and remixing OER for your own use, see 10 French Resources for Students Anywhere by Laura Franklin. << Previous PostGot Textbooks? From This Century? Thanks for a great post, Georges. I find that many educators who support openness in the abstract struggle with it in practice. It can be daunting to share “your babies” with the world. But, as you noted, letting go is key. Personally, I have found the concept of OER to be liberating. I don’t worry any more about whether materials work for everyone. If other educators like my materials…great. But if not, they are free to change ’em. Simple as that. The looks of consternation I get from some folks in academia when I talk about open access, and specifically about sharing their materials, can be immediate and profound. I’ve found I have better luck if I first introduce them to OER as consumers–showing them all of the excellent materials (created by folks like you, Georges) that are available to them. And, I usually do this in the context of discussing copyright law (fair use, the TEACH Act, etc.) which can be very limiting so the contrast of OER openness is very liberating! After laying this groundwork, it is easier for faculty to make the leap to thinking of themselves as producers of similarly available content. Sharing stories like yours, Georges, is a great way to help all educators feel more comfortable with concept–thanks! Great post! I like to think we have a sharing culture in World Languages made so much easier by technology . 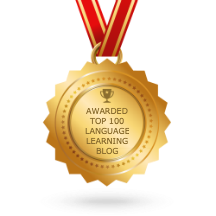 For many years, I was an active member of FLTEACH, the language listserv where everyone shares websites, exercises and resources as a matter of course. I still show up there from time to time and have met up with the “real people” from the digital list at ACTFL for a yearly f2f hello and photo opp. It is always cool to associate a face with someone you’ve been sharing with online for years. On an international level, I have benefited greatly from Juergen Wagner’s TICE Scoop.it and other European colleagues in French. I get ideas from e-merge in South Africa and from my great friend, Barbara Dieu an English teacher from Sao Paulo who I met through Webheads in Action. And I share regular activities with my French colleagues at NOVA where I teach. Among all these colleagues, no one is proprietary.